Geert Wilders (born September 6, 1963) is a Euroskeptic Dutch politician. 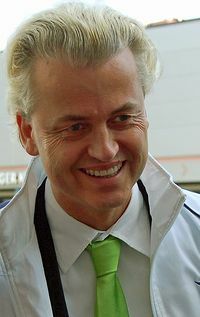 He is the leader of the right-wing Party for Freedom (PVV). He has been a member of the Dutch parliament since 1998. He is well known for his struggle against multiculturalism and for free speech in the Netherlands. Islam is primarily a totalitarian ideology rather than a religion. I feel sorry for the Arab, Persian, Indian and Indonesian peoples who have to live under the yoke of Islam. It is a belief system that marks apostates for death, forces critics into hiding and denies our Western tradition of individual freedom. Without freedom, there can be no prosperity and no pursuit of happiness. More Islam means less life, less liberty and less happiness. Lately his efforts to broadcast his movie Fitna, which is critical of Islam, have been opposed by many Dutch politicians and even the United Nations Secretary-General, who in calling for the film to be censored, nevertheless stated "the right of freedom of expression is not at stake here." Wilders strongly opposes open borders. Wilders strongly supports Israel and "s regarded as Israel’s strongest supporter in western Europe." Wilders celebrated U.S. President Donald Trump's decision to recognize Jerusalem as the capital city of Israel and to eventually move the embassy there. He also welcomed Trump's withdrawal from the Iran nuclear deal. Due to his strong emphasis on free speech and anti-Islam policy, Wilders has strong political enemies. His main opponents are Alexander Pechtold (from D66, a liberal socialist party), Jesse Klaver (from the socialist GroenLinks) and Lodewijk Asscher (from PVDA, the Dutch labor party). In addition, his strong views on Islam have caused many attempts on his life, and as such he has been under permanent police protection since 2004. In June 2018, the Dutch parliament passed a limited ban on Islamic veils, something that Wilders and the PVV had advocated for a decade. Wilders was born in Venlo, Limburg. He was raised as a Catholic but left the church at age 18 and nowadays considers himself an agnostic. His political career started in 1990. In that year he became an assistant of Frits Bolkestein, leader of the conservative liberal party VVD. In 1998 he was elected as a member of the parliament. Later he formed his own political party, the PVV. Wilders lived in Israel for a few years, where he worked as a volunteer for the moshav Tomer (located in the West Bank). In this period he travelled to multiple neighbouring countries, which have an major Muslim population, he had the impression that democracy did not exist in these countries during this travel. Between 1997 and 1998 he was a member of the City Council of Utrecht, where he lived in the disctrict Kanaleneiland. Due to his controversial statements, going against the left-wing and multicultural European establishment, Wilders has found himself the center of numerous lawsuits. In 2010 and 2011, Wilders was indicted for supposedly spreading hatred and discrimination against Muslims. He was declared not guilty in June 2011. In 2014, after the Local elections in March, Wilders submitted a position paper to the public concerning whether they wanted more or less Moroccans, making them afterwards "Fewer, fewer, fewer",in December of the same year, the Dutch public ministry decided that he should be re-prosecuted, the first session was on 18 March 2016, and the final verdict was on 9 December 2016 where he was declared guilty of incitement to discrimination and insulting a group, according to a Dutch law the Moroccans are a "race" within the meaning of Articles 137c and 137d of the Dutch Criminal Code. Wilders himself always called the judges "D66 judges" thus referring to the Progressive Liberal Party Democrats 66. ↑ Hale, Virginia (March 20, 2019). Geert Wilders Slams Dutch Open Borders Policies After Utrecht ‘Terror’ Shooting. Breitbart News. Retrieved March 21, 2019. ↑ Byas, Steve (January 1, 2019). Right-wing European Parties Seek Jewish Support. The New American. Retrieved January 1, 2019. ↑ 10.0 10.1 Harris, Chris (March 16, 2017). Five takeaways from the Netherlands' election. Euronews. Retrieved March 16, 2017. Wilders, Geert (March 30, 2017). WILDERS: Patriot Spring in Full Bloom — Dutch Have Enough of Open Door Policies. Breitbart News.